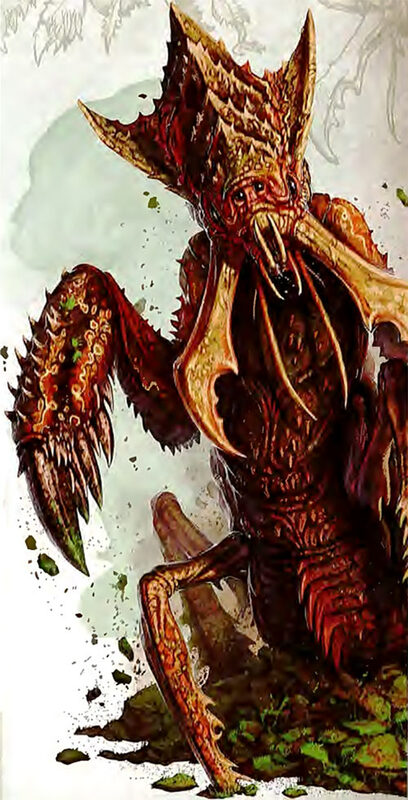 Ankhegs are part of the Dungeons & Dragons menagerie. They have been around since 1977 and kept resurfacing in subsequent editions of the game. In some ways they evoke a monstrously large antlion larva disguised as a mantis. They also appeared in D&D-based video games, particularly Baldur’s Gate (BG1). The latter is a big part of why they have a writeups.org profile. Hunting ankhegs in BG1 marks a significant jump in equipment quality, though it is a dangerous endeavour. This short profile draws from several editions of D&D, and favours their BG1 appearances when it comes to stats. Height: 10′ or so (a full-sized adult is 20′ long). Weight: 800 lbs or so for a 10′ long specimen, up to three tons for a large adult 20′ long. Colours: Chitin can be brown, green or yellow. Pinkish underside. Ankhegs are primarily burrowing animals. 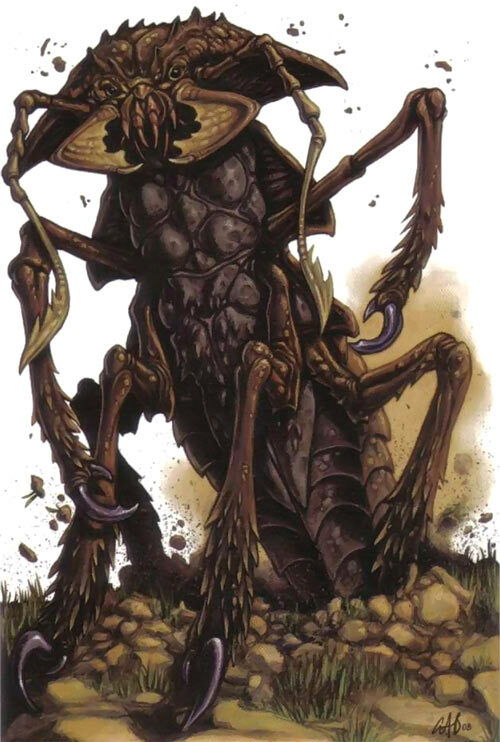 Though they look sort of insectile, it is important to remember that most AD&D creatures mock your puny Earth zoology. One thus should not assume other insectile characteristics. In some respects ankhegs evoke giant myriapods (centipedes, specifically) but in some respects they seem closer to worms. Thus, even calling them arthropods isn’t a safe bet. Ankhegs live underground. Howbeit, they also hunt surface creatures so supplement their diet with meat. This is particularly true during the mating season. During that span, females have to put on weight to prepare for a pregnancy – and to excavate an underground nest. They’ll burst out of the soil close to their target, after sensing footsteps. Observant persons moving slowly may notice the ankheg’s vibration-sensitive antennae poking from under the ground, but in a forest these are difficult to spot. 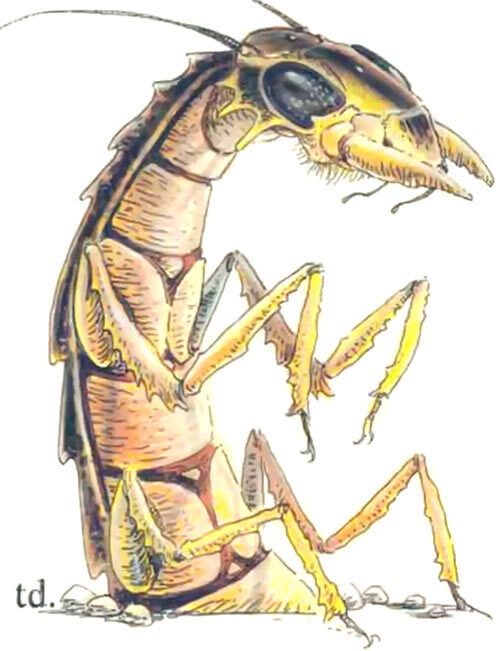 …they have large mandibles dripping with acid. These are used to grab, grind and pre-digest their prey. Ankheg mandibles can snap through a small tree. Ankhegs are big, fast and naturally well-armoured. When provoked, they’ll answer by spraying a brief but large jet of potent acid. This high-pressure spit can travel at least a dozen metres. In the video game they can repeatedly attack this way. Howbeit that’s not the case in the tabletop game. Furthermore in the tabletop game spitting out their acid mean they can’t digest anything until it gets replenished. Like monstrous earthworms, ankhegs are often seen as aerating the soil and making it more fertile. This view is highly debatable, as they also devour organic nutrients among the soil. The animals they kill may represent a greater loss than the gain in plants growth from their tunnelling and wastes. Ankhegs must live in rich soil to sustain their mass, so this usually means farmland and bountiful forests. Their tunnels are usually 30-40 feet under the surface. Usually the tunnels collapse and fill up within hours, but ankhegs boring a nest will create a more lasting structure in more solid ground. Ankhegs aren’t social animals. But if there are several in an area they might end up selecting the same patch of soft rock to create nests in. If so they’ll cohabitate without friction. Over time this might create a small underground complex of twisting tunnels. Ankhegs hibernate during the winter, after moulting their chitin. Once they wake up they’ll grow new chitin plates to armour themselves again. While unarmoured, they secrete a foul-smelling liquid to dissuade predators from eating them. 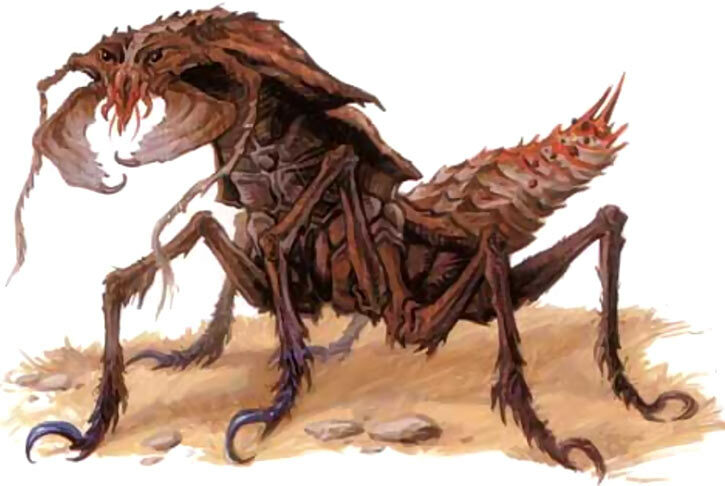 Hibernation and post-hibernation are the only times when ankhegs might have genuine predators… except for unusual circumstances, such as having a colony of giant ants nearby. 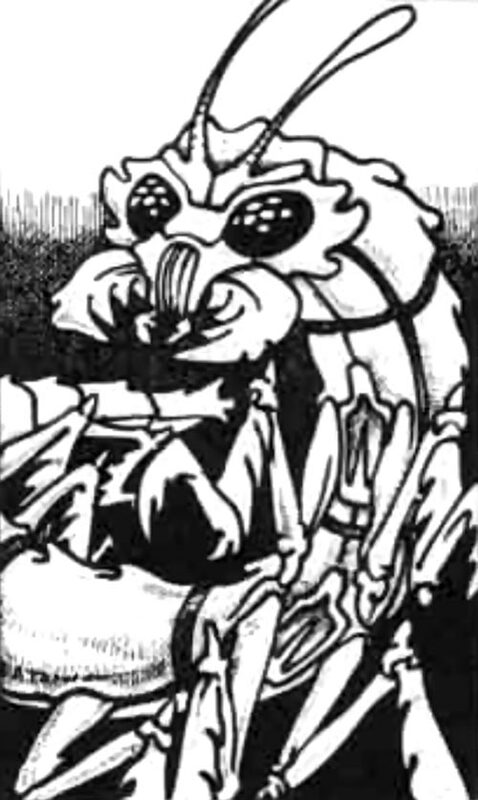 The giant ants may attempt to kidnap and enslave ankheg youths, as giant ants do. Like praying mantises, the ankheg female eats the male after fertilisation. Some specially-trained blacksmiths know how to work ankheg chitin into a form of plate armour. The resulting material is almost as hard as steel, but significantly lighter. It’s also great for those druids with a geas against wearing metal. An ankheg carcass can be used by an expert to produce a full plate armour for a Human-sized person. The limbs and other small plates provide the material for greaves, gauntlets, etc.. One suspects you can even reuse the acid to clean the chitin before processing it. The skills and tools to do that seem quite rare, however. It was only seen once, in the Forgotten Realms, with Beregost’s most reputed smith. Inf: 02 Aur: 00 Spi: 01 Wealth: N.A. All Powers are Form Function. Acid has Ammo: 01 and No Reload In The Field. If emulating the video game version, raise Ammo to 06. Acid’s Range is 03. Suspension only to hibernate during the winter. None, though the antennae poking from the ground to pick up footsteps have something comparable to Military Science (Camouflage): 03. In a way. Ankhegs are but animals. They have no manipulative limbs. They must hibernate in winter, and are quite vulnerable before, during and after their hibernation when they are sluggish and lack their chitin. See our D&D article for a discussion of scale. The larger ones could easily have Extra Limbs, but their ability to grapple doesn’t play a big role in most versions/editions. Raw STR should thus be about right, and Extra Limbs would probably make ankhegs too strong anyway. 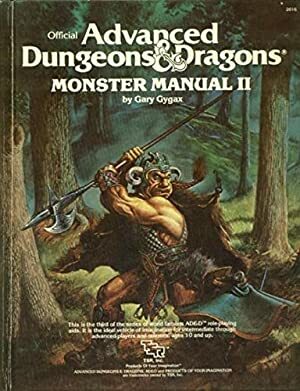 Source of Character: Baldur’s Gate and various official D&D monsters compilations. Writeup completed on the 28th of February, 2017.